Grease a 9x13 inch baking pan and set aside. Prepare brownie batter according to the recipe with the vegetable oil, water and eggs. Pour batter into the prepared pan and bake according to the directions. Let cool completely. Divide each side of the pan in thirds to cut 9 rectangles, each about 3x4 inches, and set aside. To make the fondant pieces, roll a ball of white fondant 1/8 inch thick between 2 pieces of wax paper or on a surface dusted with confectioner’s sugar. With a cookie cutter, knife or pizza roller, cut out 9 rectangles, each 2x3 inches, rolling out more fondant as needed. With a cookie cutter or knife, cut out smaller rectangles inside the fondant rectangles, 1x2 inches in size, just a bit off-center. Set aside the rectangles to stiffen on a tray lined with wax paper. Take a ball of fondant, about 2-inches across. Place several good-sized drops of black food coloring on the fondant and knead very well. Add more food coloring as needed to achieve the desired color. Roll the black fondant between two pieces of wax paper (or on a surface dusted with confectioner’s sugar) until about 1/8-inch thick. Use a 1M decorating tip to cut out circles. If the circles stick in the tip, insert a skewer or back of a paint brush through the top of the tip to gently remove the circle. Cut out 18 circles. Use the same skewer or paint brush to poke a hole in the center of the circles and wiggle to make the hole bigger. Press the other end of the decorating tip around the hole to make a star imprint. Set the circles aside on wax paper. With food coloring pens, write the names of your mix tapes on the white rectangles. Add a few drops of black food coloring to the frosting, stirring well, to tint the frosting gray. Spread the frosting evenly on top of each rectangle. Place the white rectangle on a frosted brownie. Then gently press the black circles inside the opening, assembling each to get the finished look as pictured. Size 1M decorating tip, rectangle cookie cutters (optional). If desired, you can choose any color of the rainbow to tint your frosting. The fondant should be pliable and easy to work with without being sticky. If it’s sticky, let it rest for about 15 minutes uncovered to stiffen a bit, and dust your hands with confectioner’s sugar. Just about as easy to make as brownies. But, oh, so much more fun! The creator of a mix tape is a true music fan. Find the song you love – or the one you think your love might love – by rewinding and fast forwarding to just the right spot. Hit record on the blank tape at just the right moment you start the song. Stop recording at just the right moment you stop the song. Carefully judge just the right amount of songs that will fit on each side of the tape so you don’t cut anything off in the middle. Create clever art for the case. Add the stickers. Jam a pencil in the hole and wind manually to make sure none of that tape is twisted, because if it snags on anything… Right? You know that agony? I recently found some of my old mix tapes. REM, They Might Be Giants, B52s, Fugazi, Violet Femmes, Squeeze, Cowboy Junkies... the memories flood back. Such is the beauty of the mix tape. Now, if I could only find a place to play them! 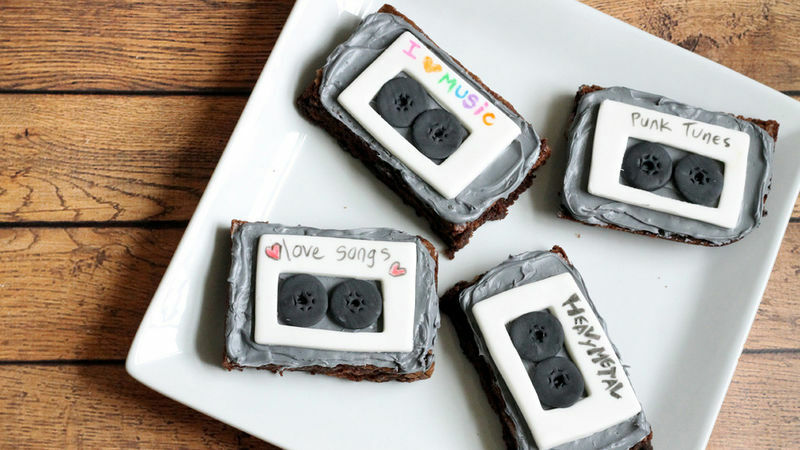 In this season of award shows, let’s show our love of music and kick it old school with some mix tape brownies. The fondant is used sparingly, so you still get the brownie and frosting deliciousness. And this design is simple enough for the novice cake decorator, so let’s dig in! Grease a 9x13-inch baking pan well. Prepare the brownie batter according to the package directions and pour into the prepared pan. Bake as directed and let the brownies cool completely. Cut rectangles about 4x3 inches with a sharp knife – which means in the 9x13-inch pan, you’ll divide each side in thirds. To decorate the brownies, you’ll need a tub of Betty Crocker Rich & Creamy Vanilla Frosting, some food coloring pens, a box of white vanilla fondant, a size 1M decorating tip and black gel paste food coloring. You can find the food coloring pens, fondant, decorating tip and food coloring at a craft store or online. Shown here are Americolor™ Gourmet Writers and Soft Gel Paste in Super Black, available online. While the brownies cook and cool, make your fondant pieces. Roll out a ball of fondant – I work with a ball about 3 inches in diameter at a time – about 1/8-inch thick on a surface dusted lightly with confectioner’s sugar, or between two pieces of wax paper. Cut out nine 2x3-inch rectangles, rolling out more fondant as needed. I have a rectangle cutter this size but if you don’t, use a knife, dough scraper or pizza roller to cut out your rectangles. Next, cut out little rectangles inside the fondant rectangles, 1x2 inches in size, just a bit off-center. Again, I used a small rectangle cutter, but you can use a knife. If the fondant is too soft to cut with a knife, let it stiffen at room temperature until it’s easy to cut. Set aside the rectangles to stiffen on a tray lined with wax paper. Meanwhile, make the tape. Take a ball of fondant, about 2 inches across. Place several good-sized drops of black food coloring on the fondant and knead very well. Add more food coloring as needed. If the food coloring and kneading cause the fondant to become sticky, let the fondant sit out awhile, and use confectioner’s sugar on your hands as needed. Warning: This will stain your hands a charming shade of black and red for a day or two! You might want to use plastic food-prep gloves. Now, roll out the black fondant just as you did the white fondant for the rectangles. Take the decorating tip and press it into the fondant to cut out circles. To remove the circles from the decorating tip, insert a toothpick, skewer or paint brush through the top and gently push to remove it. I like using a paint brush because the end is more blunt. You’ll need 18 circles. Here’s the tricky part… at least it looks tricky. Take that paint brush or skewer or toothpick and poke a hole in the center of a circle. Wiggle it around a bit so you can see the hole clearly. Then, press the other end of the decorating tip around that hole you made to make a little star imprint. Voila! You have the wound-up tape. Now set these on the tray to stiffen a bit. Now here’s the fun part! Go back to those white rectangles and name your mix tapes. Write whatever you want on the fondant using the food coloring pens.